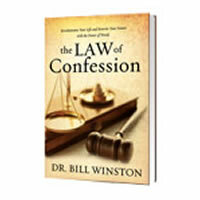 In this new book "The Law of Confession" Dr. Bill Winston reveals scriptural examples straight from the Word of God on the importance of the spoken word. You will uncover the enemy's deceptive plan to use your word against you and what you can do to turn your situation around. As you begin to change the words you speak, you will rewrite your future and begin revolutionizing your life.